Wendy Allen is an artist in residence at Gettysburg. 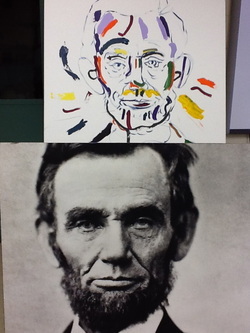 She has painted over 200 portraits of Abraham Lincoln. In 2012, Ms. Allen visited James Morris School as part of a whole-school Literacy, Social Justice, and Art enrichment program. This is just one example of how Enrichment can benefit student learning. Visit the E-Team website to see the three enrichment models offered daily by a Special's teacher: Art, Instrumental Music, Music, P.E., and Wellness. Enrichment meets for 45 minutes at the end of the school day.